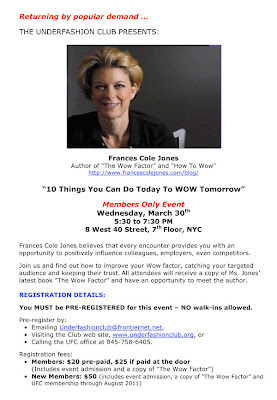 Frances Cole Jones believes that every encounter provides you with an opportunity to positively influence colleagues, employers, even competitors. Join us and find out how to improve your Wow factor, catching your targeted audience and keeping their trust. All attendees will receive a copy of Ms. Jones’ latest book “The Wow Factor” and have an opportunity to meet the author. Click the image or link below to be lead to your registration form!